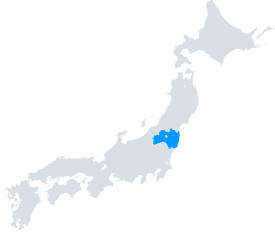 The Koriyama area is located in central Fukushima prefecture, Japan. It is well-known for its high-quality hot springs, picturesque nature, and delicious local specialties such as award-winning Japanese sake and Wagashi sweets. Discover the highlights of Koriyama area now! Miharu's name literally translates to "three springtimes" and originates from the fact that the local cherry, peach, and plum trees blossom at the same time creating an unforgettable landscape in spring. See it on a special seasonal tour! Miharu Takizakura, also known as the "Waterfall Cherry Tree", is one of Japan’s three most famous sakura cherry trees. Koriyama's iconic Kaiseiyama Park has over 1,300 sakura trees that were planted nearly 150 years ago. Over 200,000 Shibazakura (Moss phlox) cherry blossoms cover the hills of Jupia Land Hirata flower park like a cascading pink carpet. The idyllic view of more than 1,000 sakura trees blossoming along the Natsui River attracts many visitors every year. Koriyama’s most famous hot spring resort, Bandai Atami Onsen, boasts a history of over 800 years. The legend says that Princess Hagi-hime recovered from an incurable disease by soaking in the soft water of this hot spring. Bandai Atami is loved by many female visitors because its water is velvety smooth and has a skin-beautification effect. This onsen village consists of four radium hot springs perfect for a day of relaxation. The highlight of this 1,200-year-old hot spring is the outdoor rock pool that sits adjacent to the freshwater river at the base of Mt Futamata. Koriyama boasts a wonderful local gourmet culture, among which the Manju sweets are recognized as belonging to Japan’s most prominent confectionery. You can now join a tour that visits local food and sake destinations! Niida Honke is an outstanding sake brewery with a 300 year history. The brewery tours at this factory allow you to witness the manufacturing process of one of Japan’s most famous beer brands, Asahi Beer. You will find a great variety of fresh vegetables and fruits at this farmers market. Conveniently located next to Fukushima Airport, this Roadside Station is an ideal place for last-minute shopping of local specialties, fresh fruits, and vegetables. Enjoy the vast natural beauty of Lake Inawashiro, the fourth largest lake in Japan, on a boat cruise! You will see wonderful views of the iconic Mt Bandai. For the more adventurous travelers, there is also a boat cruise on Lake Hibara in the Urabandai area. Lake Hibara was created after the latest eruption of Mt Bandai volcano and holds the mystery of a submerged village. The only peony garden to be designed as a national scenic beauty place boasts a large selection of over 7,000 flowers from over 290 different species. The beautiful rice paddy art in Kagamiishi town was originally created as a way to revitalize the local community. Inside this natural wonder you will marvel at hundreds of limestone formations dating back over 80 million years. At this highland you will discover not only 33 wind turbines that produce electricity from natural forces, but also a vast field of flowers that blossom each season. Around Lake Inawashiro and Mt Bandai there are numerous top-class ski resorts known for their soft powder snow. At Takashiba Deko Yashiki village you will have the chance to immerse yourself in the local culture by making a traditional "Miharu-Goma" doll or "Hyottoko" fool's mask. You might even see the peculiar fool's dance when you meet the local craftsmen! The annual festival at Furudono Hachiman Shrine held every October is a rare opportunity to see traditional Japanese mounted archery "yabusame". In this spectacular fire festival held every November, giant torch flames blaze the sky over Sukagawa city. The 300-year-old fireworks festival held every August illuminates the night sky and gives the impression that Mt Shiroyama is erupting. Koriyama is located in the center of Fukushima prefecture and is well-connected to Tokyo and Sendai by Shinkansen bullet train. By car you can easily reach Koriyama taking the Tohoku Expressway. The Koriyama area offers a large variety of accommodation facilities for every taste, including relaxing hot spring resorts, ski slope inns, traditional ryokans, city hotels, family-run minshuku inns, and more! Book your accommodation in the Koriyama area easily and without hassle. 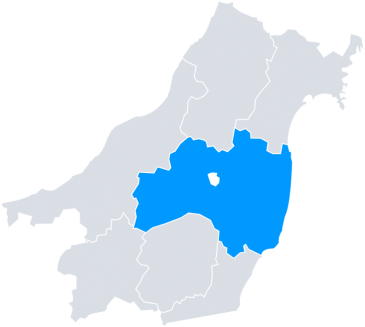 Want to Learn More about the Koriyama area? Copyright © 2011-2017 VOYAGIN PTE. LTD. All Rights Reserved.